Hunroor was a Nord warrior from the Second Era. He and four companions embarked on a quest to find Sovngarde. However, Hunroor, Erlendr, and Nikulas were betrayed by the wizard Grimkell, who turned them into stone pillars at Brodir Grove on Solstheim. They were avenged by Ulfgar the Unending, who killed the wizard. All of the friends eventually did find their way to Sovngarde. 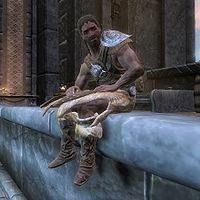 Hunroor was mentioned in the Bloodmoon expansion for TES III: Morrowind, and was featured in TES V: Skyrim. This page was last modified on 29 June 2013, at 13:09.